Samsung is one of the most trusted brands when it comes refrigeration segment. Reliability, versatility and after sales service is what makes Samsung most preferred choice amongst the Indian consumers. That’s the very reason it dons a big chunk of market share in cooling appliances department. Also, Samsung is a brand known for innovation. Advanced features in its premium line up like All-around Cooling and Convertible 5-in-1 are examples of it. We will cover these in more detail in this article. With a new line up of refrigerators this season, Samsung has brought incremental changes in its features to cater the evolving needs of its customers, in a constantly upgrading world of technology. Normal mode: This is the usual mode with the top compartment of the refrigerator used as freezer while the bigger bottom part for normal refrigeration. 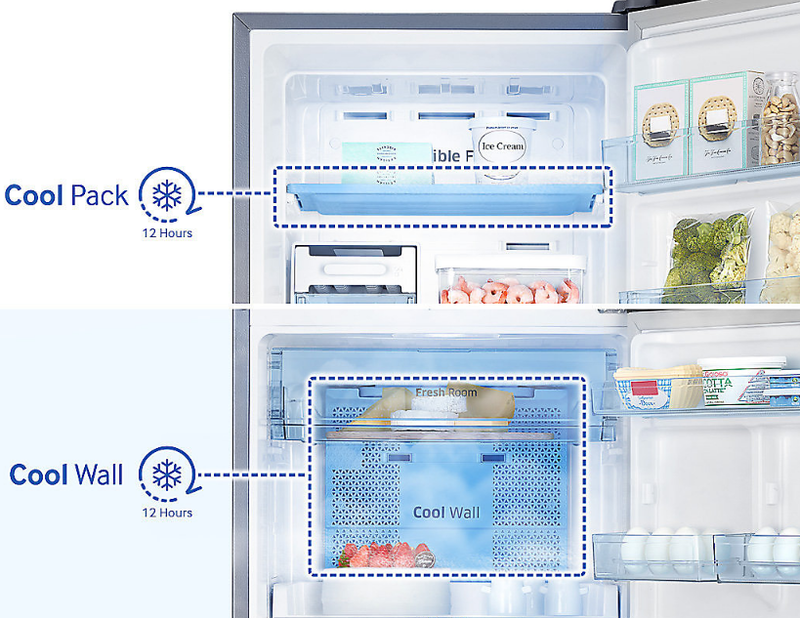 With this option enabled, users can not just have a fridge space that keeps a fresh supply of food for long but also a freezer which gives ice pretty faster. Extra Fridge mode: According to one of the studies, Indians consume much lesser frozen food than the western counterparts. This is because a good percentage of Indians are vegetarians and probably won’t need freezer that much. Extra Fridge mode gives the liberty to convert freezer compartment into the normal. If you are a vegan who often ends up bringing home more bags of veggies than that can be stuffed inside the refrigerator, this option would be your saviour. Seasonal mode: With the option of Extra Fridge mode you can beef up your only refrigeration requirement. But what if you neither need extra space for refrigeration nor the freezer at all? Well, the answer to this is the Seasonal With this mode enabled, you can turn off the freezer without impacting the smooth functioning of the refrigerator compartment. This will also help you to conserve electricity. Vacation mode: Refrigerator works 24×7, 365 days a year (provided no power cuts occur). This means they are incessantly consuming electricity. There would be times when you would move out of your home/city for vacation, wedding, or other purposes. That too for a longer period of days. Obviously then, neither you would be carrying along the refrigerator nor would be anyone using it. But your ordinary refrigerator would keep on vociferously piling up your electricity units. To rescue you out of this predicament, Samsung offers Vacation mode wherein you can simply turn off the bottom refrigerator compartment while only the freezer compartment continues to work usually. Thus, on your vacations and outings, you can enjoy more and worry less about refrigerator gobbling up power units. Home Alone mode: There would be times when your family members go out, but you don’t—because of the exam, office work or some other priorities. There are good chances that you won’t actually need that big volume refrigerator working with full power. Also, with full power comes big electricity bills! So again, to your rescue would be Home Alone mode wherein you can shut down the refrigerator compartment and shift all your small stock of perishables to the top compartment which is now converted into a mini refrigerator. Premium double door refrigerators come with the All-around Cooling system. It helps in cooling every corner of the fridge evenly. Here, multiple vents are uniformly placed on each and every shelf, so when the cold air is blown through them it is easy to maintain the requisite (cold) temperature which ensures the food inside the refrigerator stays fresh for longer. There is always a risk of mixing odours of different food when kept in close proximity inside the refrigerator. This results in foul odor—ice cube smelling like garlic bread. 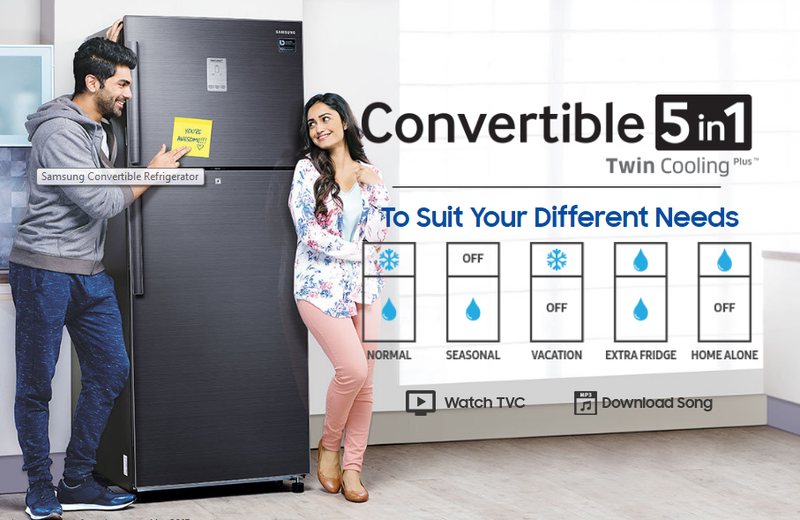 To overcome this problem Samsung uses Twin Cooling System in its premium series double door and side-by-side refrigerators. This system provides two separate air flows and precise temperature control to maintain optimal humidity levels on both the refrigerator and freezer sides. Also, it is complemented by Active Fresh Keeper technology which keeps the fridge clean and hygienic. The arrangement of the Activated Carbon filter is used, through which the air passes so that it is constantly deodorized. There is also anti-bacterial mesh arrangement which kills the harmful bacteria. You’ll see the power of LEDs everywhere with modern Samsung refrigerators. First with the illumination and then with the display. Talking about illumination aspect of LED, Samsung modern refrigerators are equipped with new LED lighting which is not only slimmer but also softer and much more energy efficient. As they occupy lesser space, they help in increasing the usable fridge space for storing the perishables. This LED lighting system emits 10 times lesser heat than the ordinary bulbs. This means food would remain much more immune to temperature swings owing to the lighting arrangement. This LED comes with eco-technology which consumes 20 times less power than conventional light bulbs. Also, they are designed to last 2 times longer. Thus, this way users can save a good sum of money as they consume much less amount of energy while having a good longevity, meaning lesser repairs and replacements. To complement this highly efficient LED illumination system, premium H series refrigerators from Samsung comes with beautiful blue LED display. This display provides all the cooling information and control at fingertips of the user. Now, from an energy saving perspective, it’s not a very good idea to keep opening the door of refrigerator intermittently to sniff what’s inside. Because every time you open your fridge, it needs to rework to balance the requisite temperature inside the refrigerator. But with the ultra-modern Samsung refrigerators powered with intuitive LED display outside, the user can know what’s happening inside the refrigerator without needing to open the door every time. If the information displayed on LED still cannot control the urge of opening the door, premium French door refrigerator from Samsung comes with Food Showcase—a transparent see-through glass door, through which the user can see food items inside the refrigerator. Modern side-by-side and French door refrigerators from Samsung comes with Ice Master technology. Here, there is a dedicated space is built into the door which generates and stores the ice automatically. Since it’s a transparent compartment, the user can precisely see the amount of ice available. Also, there is ice and water dispenser on the exterior of the refrigerator. The dispenser in multi-door refrigerator comes with a tall opening, so pitchers and even big bottles can be easily filled with filtered water and cubed ice. Premium Samsung refrigerators come with buttons called Power Cool and Power Freeze. Power Cool quickly chills food and drinks simply at the press of the button while Power Freeze on the other side freezes (firms up) the frozen food and helps in making the ice in a jiffy. With these features, users can instantly get ice or chilled water. Power cuts and load shedding is commonplace in India, especially in distant towns and villages. Since refrigeration generally works 24×7, it is a home appliance most susceptible to the erratic blackouts. Power cuts poise two problems for the refrigerator. First is the spoilage of food in case if power cuts persist for a longer duration of time. Second is much more hazardous—damage to the refrigerator due to voltage fluctuations. Samsung’s new refrigerators are well-equipped to handle this crisis. It comes with a good cooling retention plan in the form of Cool Pack and Cool Wall. Cool Pack is a gel-like material located in the freezer on both sides. Cool Packs keeps the food well frozen for few hours without power, and keep the freezer compartment cold even in the absence of electricity. This means even ice cream kept inside the refrigerator won’t melt for few hours in case of blackouts. Samsung is the first manufacturer in India to come with a Cool Wall inside the refrigerator—an especially designed wall which retains cooling even during power cuts for several hours. Thus, with Cool Pack in the freezer and Cool Wall in the fridge, food items stored inside the refrigerator can remain chilled for up to 12 hours with spoilage during the power cuts. New series of Samsung refrigerators also comes with the stabilizer-free operation. What this means is that refrigerator can work steadily and reliably without getting damaged due to excessive flow of electricity in case of voltage fluctuations. Also, if voltage fluctuation exceeds the preset permissible limits (100V-300V), the power supply is automatically switched off, so it does not cause any harm to the refrigerator. Thus, Cool Pack, Cool Wall with the stabilizer-free operation design makes a good cooling retention plan in case of blackouts and safeguards refrigerator from the vagaries of voltage fluctuations. Compressors in the lower-end/primitive refrigerators come with single speed motor. They are either “on” or “off” based on the temperature in the refrigerator. Such compressors are designed to work incessantly at the peak load conditions (for high temperatures in summers), which means that they run at peak load even in winters when the cooling requirement is less. This is where reputed brands like Samsung excels. Samsung arms its compressor with a smart digital inverter with 7 adjustable speeds to suit different cooling demands. Working of this compressor with inverter technology is analogous to the car accelerator. When the speed required is more, the acceleration is more, and when it is less, and then the acceleration is less. This makes sure that during the summer season when the cooling load is more, the compressor works at the peak capacity taking more electricity. But during winters when the cooling load is less, the compressor runs at the lower speeds thereby consuming less electricity. Even during summers, the night temperature is less than the day temperature. Thus, electricity is saved even during the late evenings when compressor can run at a lesser speed. Complementing this digital inverter, Direct Cool—a new series refrigerator from Samsung run on solar panel with negligible power consumption from the main supply. Another good part is that they can operate on home inverters ensuring smooth operation of refrigerator even during power cuts with up to 9 hours of cooling retention. With the government’s efforts to promote and subsidize solar power, Samsung believes this solar connect refrigerators will go a long way in energy conservation. Samsung is definitely one of the most trusted brands when it comes to consumer electronics and appliances. Alongside LG, it is the brand which keeps bringing innovation in refrigeration technology. We have already seen utility in the modern, fully convertible Samsung refrigerators. Moreover, Samsung is coming with smart refrigerators which would come with touchscreen and refrigerator cameras in its premium multi-door refrigerators in the future. Samsung is India’s first and only brand offering smart digital inverter even in single door refrigerator that too with a 5 Star Rating, 10-year warranty on the compressor. Compressor with an inverter is arguably the greatest refrigeration technology in recent years which helps in saving considerable units of energy. Samsung’s inverter compressor coming with 7 speed setting for the precise temperature control further glorifies its utility. If you are someone who is tech-savvy and wants the best of technology, then you can surely go for multi-door Samsung refrigerators. But there is a caveat: you’ll need to pay the inordinately high price to own that technology-laden refrigerator.